It's Giving Tuesday. 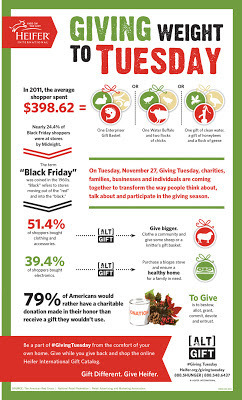 I'm not sure that Giving Tuesday should be stuck behind Thanksgiving Dinner, Black Friday, Small Business Saturday and Cyber Monday! Who would have any leftover MONEY. But it is a great idea. Harry, like many people who have ever given a dollar, gets tons of requests for charity. So many we never know which one to give to. When you give once, it seems they send a notice every other week. (And I think that makes money for the company that is SENDING the requests and not the actual charity...but I digress.) To combat this excess, we set aside Harry's birthday as the one day of the year to make ALL his charitable contributions. That way, we know who we have given to and we can throw away all those repetitious mailers. 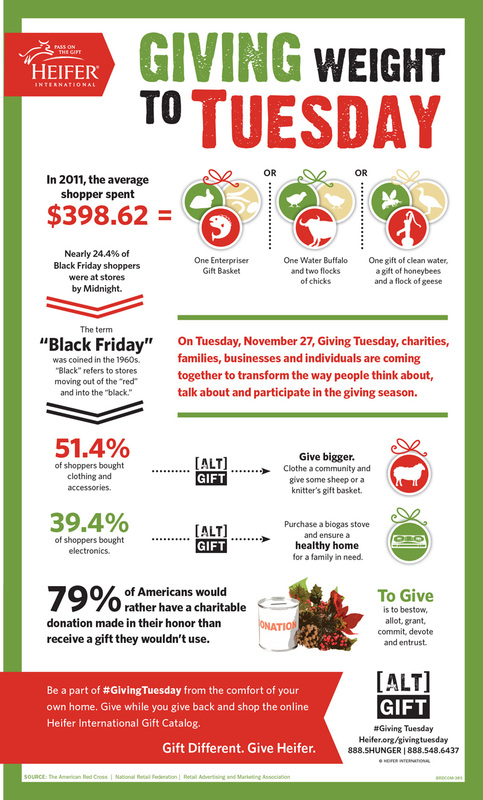 In a survey 79% of Americans would rather have a charitable donation made in their name than to receive a gift they wouldn't use. Make someone you love or like or whose name you got in the Secret Santa drawing HAPPY by donating to a good cause like Heifer International.